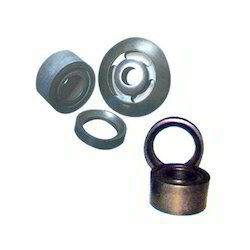 We are engaged in manufacturing and supplying Steam Joint Rings. Using advanced technologies these joints are made which sustain high temperature & pressure. We manufacture Carbon Steam Rotary joint rings that are used in rotary pressure joints. These Carbon seal rings & Carbon guide rings have an effect over the flow of liquid or steam form a stationary supply pipe end to a mobile machine part. Machines such as rubber mixing roller mills, calendaring machines and cylinders are used in paper, plastic, chemicals and textile industries. 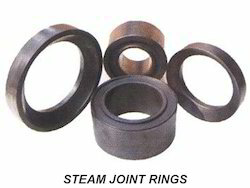 We are manufacturer of Steam Joint Rings. 1. Compressed Asbestos Fibre (CAF) Jointiing Sheets in both metallic and Non-metallic varieties of all grades. 2. Compressed Non-Asbestos (Asbestos Free) Fibre Jointing Sheets of all grades. 3. Spiral Wound-Gaskets filled with CAF/Flexible pure Graphite / PTFE. Carbon Steam joint seals water, steam and oil. Our company has gained name and fame in presenting Carbon Graphite Steam Joints. Shree mangalmurti D Joint Ring, Size: 2" 3" 4" 5" 6" 2.5"
Size: 2" 3" 4" 5" 6" 2.5"
Manufacturer of Textile jointrings - Pipe line Joint rings - Ac dut frame - A to Z Jointrings.